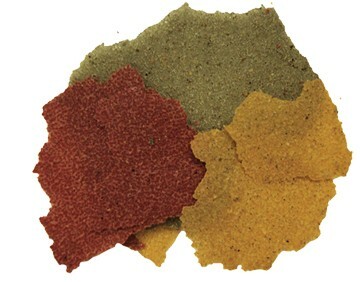 Brown’s® Encore® Natural Tropical Fish Flake Food is a nutritionally optimized, color-enhancing daily diet for tropical fish. Our unique color-enhancing formula naturally enhances your fish’s brilliant colors without the use of artificial colors or preservatives. 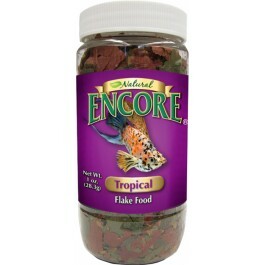 Brown’s® Encore® Natural Tropical Fish Flake Food is a nutritionally optimized, color-enhancing daily diet for tropical fish. Our unique color-enhancing formula naturally enhances your fish’s brilliant colors without the use of artificial colors or preservatives. Brown’s formula also improves food utilization and minimizes fish waste for cleaner, clearer water. Each flake contains Spirulina, nature’s superfood, plus vitamins, minerals, trace elements, and Vitamin C to help support a healthy immune system. Salmon Meal, Wheat Gluten, Brewers Dried Yeast, Shrimp Meal, Krill Meal, Feeding Oat Meal, Plankton Meal, Spirulina, Lecithin, Calcium Carbonate, d-Calcium Pantothenate, L-Ascorbyl-2-Polyphosphate (Stabilized Source of Vitamin C), Niacin, Biotin, Riboflavin Supplement, Thiamine Mononitrate, Menadione Sodium Bisulfite Complex, Pyridoxine Hydrochloride, Vitamin A Acetate, Folic Acid, Vitamin D3 Supplement, Vitamin B12 Supplement, dI-Alpha Tocopherol Acetate (Source of Vitamin E), Choline Chloride. Colors Added (Carotene Color, Natural Astaxanthin, Iron Oxide, Algae Meal).